The race was delayed after a clash between police and protesting farmers. Alaphilippe wearing the dotted jersey. JULIAN ALAPHILIPPE, OF the Quick Step team, soloed to victory on the Tour de France 16th stage today after capitalising on a late crash by Britain’s Adam Yates of Mitchelton. Frenchman Alaphilippe, claiming his second stage win of the 105th edition, finished nearly 20 seconds ahead of a small group of chasers on the first of four days in the Pyrenees. Ireland’s Dan Martin came in right behind Thomas and the UAE Team Emirates rider sits 10th in the general classification. Ahead of stage 17 on Wednesday, described as the most decisive stage in the final week, Welshman Thomas maintained his 1min 39sec lead on four-time champion and team-mate Chris Froome. 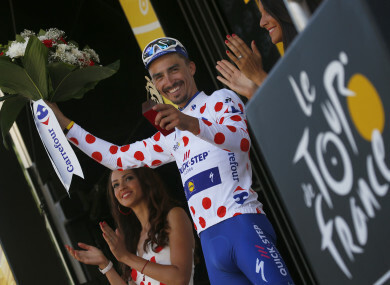 But the day belonged to Alaphilippe, who has spent the past 10 days chasing points to add to his collection for the King of the Mountains’ polka dot jersey. Yates was on his own and racing towards a possible stage win when he crashed on the descent of the Col du Portillon, the fifth and last climb of the day, his front wheel skidding away from under him as he negotiated a left-hand bend. Just as Yates got back on his bike, Alaphilippe sped past, looked around at the Englishman and surged ahead. The 26-year-old Frenchman did not look back on the downhill section into Bagneres, where he had plenty of time to soak up his second win of the race. I’m delighted,” said Alaphilippe. “It was really hard to get into the early breakaway and the rest of the day I was suffering. Email “Frenchman Alaphilippe takes advantage of late crash to claim stage 16 of Le Tour ”. Feedback on “Frenchman Alaphilippe takes advantage of late crash to claim stage 16 of Le Tour ”.